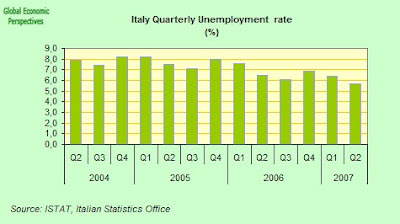 Italy's unemployment rate unexpectedly dropped to a record low in the three months through June as the economy expanded for a second year, prompting companies to step up hiring. The jobless rate fell to 6 percent from 6.2 percent in the first quarter, the Rome-based national statistics office Istat said today. 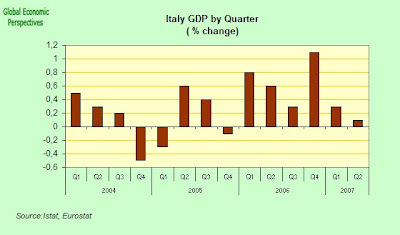 That is the lowest since 1992, when Istat began to record the figures. This growth-driven stepping-up hiring picture - which is by no means unique to Bloomberg - unfortunately isn't quite the whole Italian labour market dynamics story, as the latest complete data set from ISTAT reveal. Let's have a look at why it isn't. 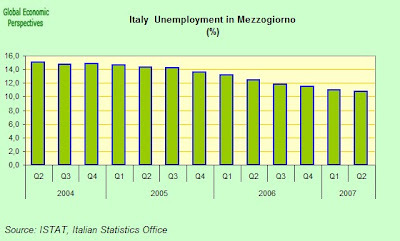 First off, Italy's unemployment rate has been declining, there is no doubt about that. 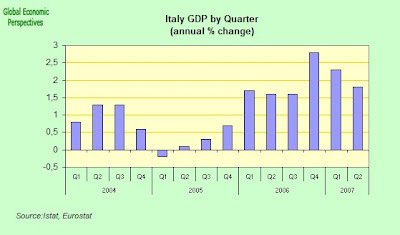 Here's the chart from Q1 2004 onwards. But how do we interpret this drop in employment? That is the question. Is there more going on here than meets the eye at first glance? This situation is extremely preoccupying, especially since the South has been receiving comparatively little immigration. 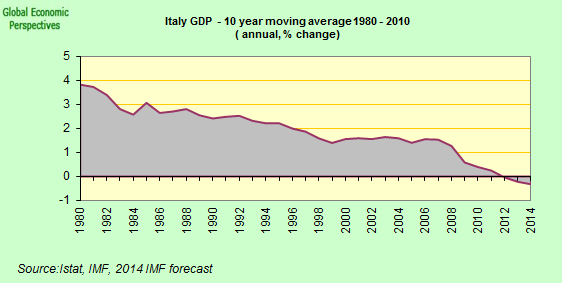 It is preoccupying since it is quite simply unsustainable. 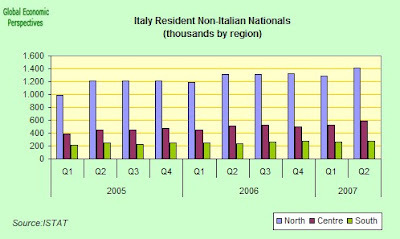 And again, while the economically active migrant population do have a slightly higher unemployment rate than the native Italian equivalent, the order of magnitude is not large, especially given their very high participation rates. 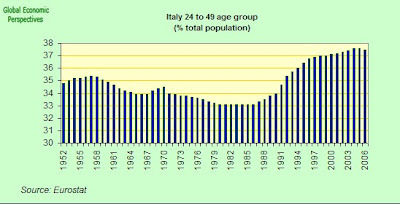 One of the principal problems Italy is now facing is that the number of workers in the most productive age groups is now starting to decline as a % of the total population. If we take a look at the chart for the 25 to 49 age group, we will see that this group rose steadily as a share of the total till the early years of this century. Then the proportion started to level off, and now it is just begining to turn down. 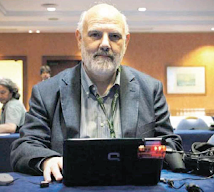 25 to 49 isn't necessarily and exact measure of the most productive group, probably 35 to 50 would be better, but it is the data we have from Eurostat, and it is a good enough measure of the extent of the problem. 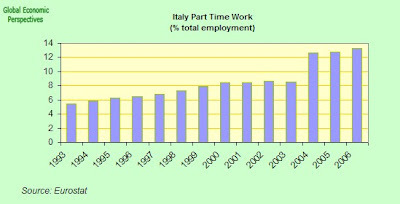 If we look at part-time employment as a proportion of total employment, we will see that this has also been on the rise in Italy in recent years, and again this is not surprising in the light of the population ageing which is taking place, and what we know about the impact of this on the functioning of labour markets. 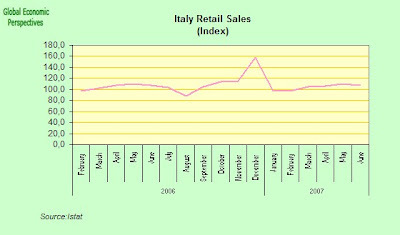 An examination of the retail sales chart tends to confirm this prognosis, after a spike at the end of last year, sales dropped back, and there is now virtually NO change year on year over the previous corresponding months in 2006. 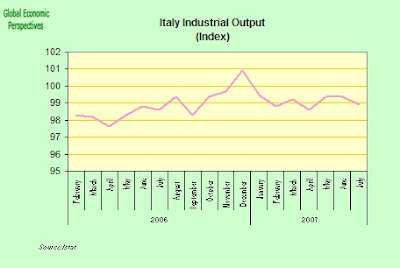 The industrial output trend seems to be very similar, which a spike at the end of 2006, and output actually turning down after May 2007. 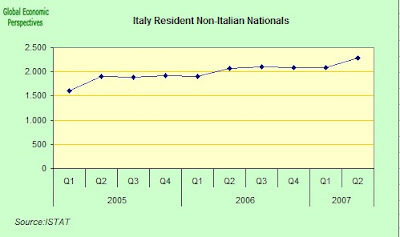 At the end of the day all I can really say about the more complete picture we can get from this data, is that it is now well past time that people stopped selling themselves pipedreams that everything is running smoothly and that the need to address the real structural ageing-related issues which Italy actually faces is getting to be more urgent by the day.